9 breakfasts, 7 lunches and 7 dinners. Starting in Cairo, you can explore the ancient wonders of the world including the Great Sphinx and Pyramids. Then, float down the grand Nile River for seven (7) nights, visiting the temples of Luxor and Karnak, the Valley of the Kings, free time in Aswan, the gardens of Felucca, temples in Kom Ombo on this luxurious round trip journey as you Cruise Egypt – Gift of the Nile. Around 5,000 years ago the ancient Egyptians established an extraordinary and enduring civilization. Archaeologists are still, today, unearthing fabulous temples tombs and pyramids buried along the shores of the life-giving Nile River. We have only begun to see the grand glory and scope of the Egyptian civilization… the thrill of discovery continues! An overnight in the bustling city of Cairo allows for optional sightseeing: you may choose to visit the pyramids and Sphinx, the Citadel, old town bazaars or the historic Cairo Museum with its unique Mummies Room. Next stop is picturesque Luxor, often been called the world’s greatest open air museum. It is here you will join your luxury Mirage Cruise, while continuing to explore the Luxor area. The number and preservation of the monuments in the Luxor area is unparalleled anywhere else in the world. Discover the fabulous Luxor and Karnak Temples as well as the famed Valley of the Kings, home to the Tomb of Tutankhamen. 7 nights will be spent cruising the fabled Nile River, from Luxor to Aswan, and then back to Luxor. Each day you will disembark, with an Egyptologist, to discover such storied sights as Edfu and Kom Ombo. Located about 81 miles south of Luxor, Aswan has a distinctively African atmosphere. In Aswan the Nile is at its most beautiful, flowing through amber desert and granite rocks, round emerald islands covered in palm groves and tropical plants. Explore the souks, full of the scent and color of spices, perfumes, scarves and baskets. Sights of Aswan include the Unfinished Obelisk and a boat ride to the Philae Temple of Isis. 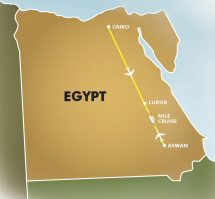 An overnight flight to Cairo. Arrive in Cairo, with optional sightseeing in this historic city. Chance to explore such world renowned sights as the pyramids, Sphinx, Cairo Museum, Citadel, Mosque and Khan el Khalili Bazaar. Fly to Luxor and join your luxury Nile Cruise. Visit the fabulous Temples at Luxor and Karnak. Cross the river to the fabled Valley of the Kings. Descend into tombs and delight at the colorful hieroglyphics and ornate sarcophagi. Enjoy glimpses of Egyptian life as you cruise peacefully along the fabled Nile. At each disembarkation, you will be with an Egyptologist who will make ancient history come alive. Explore the ruins at Kom Ombo and Edfu, including the temple dedicated to the crocodile god, Sobek. At Aswan, visit the High Dam, Unfinished Obelisk, Philae Temple and the Botanical Garden by Felucca. Disembark your Nile Cruise in Luxor, to spend your final night in Egypt. Fly back to Cairo in time for the departure of your international flight. A perfect vacation ends – but the memories and photographs will be forever!! Twice a year during the equinoxes, a miracle happens at Abu Simbel. And our dream was finally real! The sun was climbing steadily, igniting the shimmering desert sands. Excited and nervous, we stood flanking the inner chamber. Suddenly, a shaft of pure white light poured through the sanctuary and anointed the visages of four sacred statues. Did I see a wry smile brush the granite lips of mighty King Ramses?